The recent global 'resource boom' manifests in a rise of national budgets as well as GDPs of many states. However, the trend towards extractivism as a development strategy across the global South has also social and political effects. When state revenues, growth and national well-being depend on resource extraction, societal and institutional norms and state–society relations are shaped in specific and contested ways. Struggles over land and mining have thus increased around the world, with a rising number of non-state and state actors being involved. 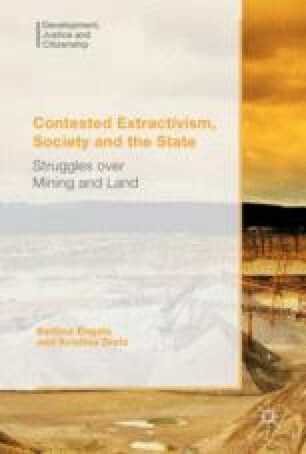 This introduction outlines a framework of analysing struggles over land and mining in the context of global transformation processes as well as the relevance of these processes for state–society relations. HWWI. (2015). HWWI-Index der Weltmarktpreise für Rohstoffe (US-$-Basis). http://hwwi-rohindex.de/typo3_upload/groups/32/hwwa_downloads/Rohstoffindex-dia.xls.pdf. Accessed 15 May 2015. Larsson, V. (2014). E&MJ’s annual survey of global metal-mining investment. E&MJ Engineering and Mining Journal. http://www.e-mj.com/features/3674-e-mj-s-annual-survey-of-global-metal-mining-investment.html#.VlV427_1LCt. Accessed 25 Nov 2015. Walter, M. & Urkidi, L. (2015). Community mining consultations in Latin America (2002–2012): The contested emergence of a hybrid institution for participation. Geoforum, online, http://dx.doi.org/10.1016/j.geoforum.2015.09.007.